Our lifestyle, culture and history of injury can contribute to our ability to move. Many people of various cultures are able to squat rather deeply even as older adults, but in the United States this seems less common. Tight hips, decreased knee range of motion and tightness in the calves can all make squatting with depth difficult. 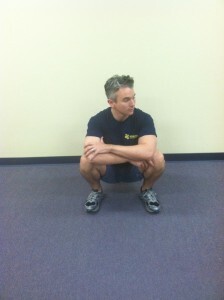 When indicated, the deep squat can be utilized as a general lower body stretching exercise. In many cases, gaining the flexibility to get into a deep squat position may allow for a generally greater ease of movement. Carry over from improvements in hip mobility, calf flexibility and knee range of motion may result in improvements in activities such as the ability to kneel, stoop and play with children or pets. Like other static stretches a mild to moderate stretch is appropriate. Pain should not be felt. What does a deep squat look like? The deep squat is a general way to screen for quality of movement, flexibility and injury.1,2 If the squat does not look somewhat like the pictures, there may be flexibility deficits in the hips, knees or calves. 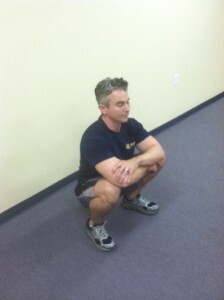 Simply getting into a squat position and holding for 30-60 seconds several times a day should help to increase mobility. After a couple of weeks significant changes in the ability to get into a deep squatting position should be noticed. When squatting until the calves touch the thighs I recommend muscle tension in the front of the thighs so that the knees are not unnecessarily stressed. 2. Butler RJ, Plisky PJ, Southers C, Scoma C, Kiesel KB. Biomechanical analysis of the different classifications of the Functional Movement Screen deep squat test. Sports Biomech. Nov 2010;9(4):270–279.